It’s kind of tough at the moment to play this basket on the Bryant Park disc golf course. Nobody was standing under this Bryant Park tree when the trunk snapped during the recent wind storm. But one of the baskets of the disc golf course was. I’m not sure, but the downed tree looked like an Oregon ash. At least that’s the closest I could come by comparing the leaves to the drawings in the National Arbor Day Foundation’s handy little tree finder, which I’ve had since the foundation sent me a free copy years ago. Disc golfers can presumably work around this obstacle until the fallen tree is removed and the basket is bent back into shape or replaced. Judging from the regular use the course has been getting lately when the weather is fair, and even when it’s not, missing one basket on the 18-hole course has not made much of a dent. 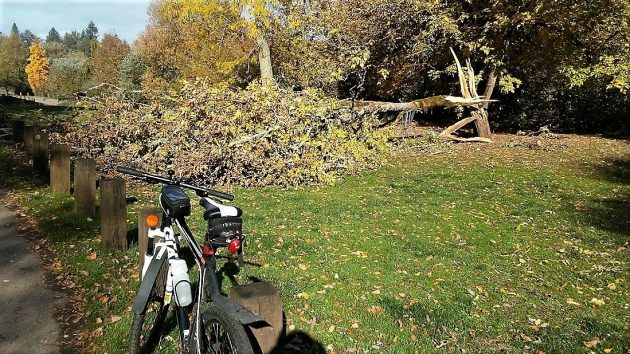 Maybe the basket can be salvaged once the tree is removed. 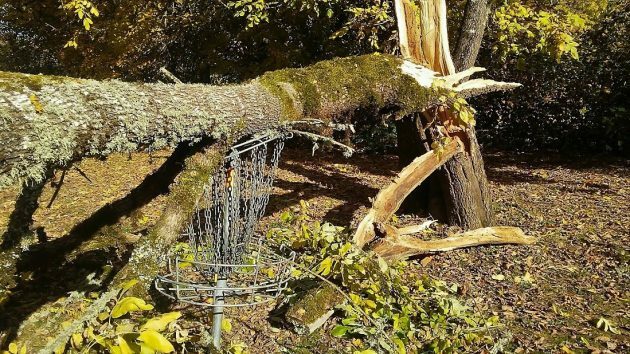 Having witnessed several disc golf foursomes on this course, its unlikely the game’s aficionados would be troubled by the loss of of a single hole. Disc golfers are, by nature, a lackadaisical sub-genre, given to lethargy, with ample opportunity for giggling and lounging.